1. Cover pretty side of the paper with a strip of 2-1/2” wide Super Sticky Tape. 2. Use removable tape to secure a flower die to the Super Sticky Tape (be sure the die is taped to the patterned paper, not the glossy liner of the Super Sticky Tape). 3. Cut out the die using your tabletop machine. 4. Remove the glossy liner from the diecut flower, revealing the sticky surface. 5. Pour Sugar Beads or Sugar Sand over the front side of the image, covering the exposed sticky tape. 6. Give some dimension to the petals by pinching the sides together - you can pinch the sides up \/ or down /\. 7. 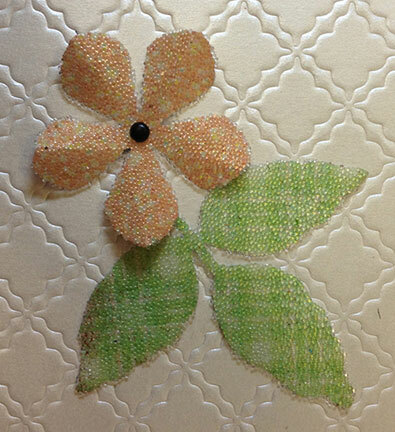 Finish the center of the sugared flower with a brad, button, Candi, pearl or other embellishment. VARIATION: Add a pinch of Sparkly Sweet UF Transparent Glitter to the Sugar Sand or Sugar Beads for extra bling!